PATH Intl. welcomes HandiRamp as its newest Pewter Level Sponsor. HandiRamp has generously donated to PATH Intl. a portable ramp that is specifically designed for use in therapeutic horsemanship. (Click here for information on the ramp.) Come see the ramp at their exhibitor booth during the conference, and bid on the ramp at the silent auction. The ramp is valued at $2,450 and bidding will start at $750. With the recent flooding in Colorado, many people have asked how they can help the centers that may have been affected by this and other natural disasters this year. PATH Intl. maintains a Disaster Relief Fun to help centers with an immediate need in funding expenses not normally covered by operating insurance after natural or man made catastrophic disasters. Click here for information on the PATH Intl. Disaster Relief Fund. Click here to donate to the fund or contact Megan Ferry, (800) 369-7433, ext. 107. It is with sadness that PATH Intl. announces the passing of past president Dr. Paul A. Spiers on September 11, 2013, in Danvers, MA. Paul was a Forensic Neuropsychologist and Assistant Professor of Behavioral Neurosciences at Boston University School of Medicine and was involved in research at MIT. He was president of the PATH Intl. Board of Trustees from 2006-2008. An accomplished rider and a polo enthusiast at the Myopia Club, Paul was rendered paraplegic in 1994 while on a hunt. He rehabilitated in part at Windrush Farm Therapeutic Equitation, Inc., where he served as board president from 2006 until his death. Paul was instrumental in promoting the PATH International Equine Services for Heroes initiative (then NARHA Horses for Heroes). 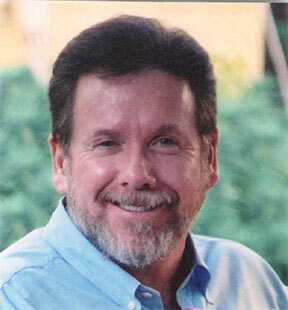 "Paul was a wonderful board president," said PATH Intl. CEO Kay Marsh Green. "He brought a perspective to the association that was important." "Paul was the champion of the veterans' programming," said Teresa Morris, PATH Intl. past president and executive director of Fieldstone Farm Therapeutic Riding Center. "He was very much respected for his fierce independence, his wicked humor and his great passion for the organization." A memorial service will be held for Paul on September 24, 5 to 7 p.m., at the Myopia Polo pavilion in Hamilton, MA. Do you ever struggle with teaching to a group? Measuring a rider's progress? Helping a rider progress to the next skill level? Or having a consistent data collection methodology for all your riders? Then "Rider Skill Levels: It's All About Progression" is a must-attend session! Presenters Alice Duva, Lisa McKinless and Lindsey Wood will introduce you to the R.I.D.E.S. system, which is a process used for teaching mounted and unmounted skills from the basics up through cantering while setting and measuring rider goals and objectives. The PATH Intl. pre-conference event, Community Connections Day, is Wednesday, November 6th. Attendees may attend up to four of the following sessions: choose a full day of PATH International Equine Services for Heroes sessions or mix and match presentations with the other great topics. The cost is $55 for PATH Intl. members and $65 for non-members for the full day. Click here for session descriptions and bios. More than 54 million people visit Orlando each year for vacation or business, making it one of the largest tourist destinations on Earth. Orlando's Wet N' Wild water park is the first water park in the world. It is also one of the few water parks that can stay open 365 days a year. You work hard throughout the year. You need a vacation! PATH Intl. has just the thing you need to turn your 2013 PATH Intl. Conference and Annual Meeting into a great vacation. Click here for ways to extend your time in Orlando by buying discount tickets for Orlando attractions, such as Disney theme parks, by making reservations through an exclusive PATH Intl. partner, or by participating in the PATH Intl. Destination Vacation Online Auction. 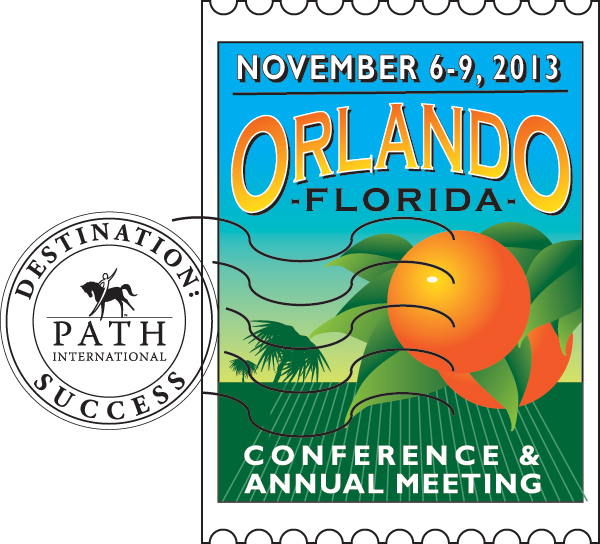 If you are looking to share a room, suite or villa for the conference, check on the PATH Intl. website for a list of others who are looking or who have a room booked. PATH Intl. does not take responsibility for making the connection, but we are happy to list those looking for roommates. If you would like to place your name on the list, email Cher Smith or call her at (800) 369-7433, ext. 123. Interested in learning more about the Society of Visionaries? Join us Friday, November 8, for lunch during the PATH Intl. Conference. More info to follow in October. PATH Intl. will be holding a webinar on "How to Start a Therapeutic Driving Program" on Tuesday, September 24th at 5 p.m. Mountain Daylight Time. Please email Denise Fager if you would like to attend. The certification department will be holding a mandatory webinar on "Report Writing," presented by Sandy Webster, on Wednesday, September 25th at 5 p.m. Mountain Daylight Time. Please make every effort to attend as there will be time available for questions. If you cannot attend on this date, a recorded version will be available. You will receive an email soon with the log-in information. Thank you to all our members who participated in the equine-facilitated learning survey. We had an overwhelming response from our members, which will help us as our association continues to evolve. Congratulations to Svetlana Hruda, winner of the EFL package. Thank you again to Debbie Anderson and Strides to Success for the donation of their book Marvelous Minis as part of the prize package. PATH Intl. welcomes Sam Albrecht, the new PATH Intl. Director of Membership and Programs. 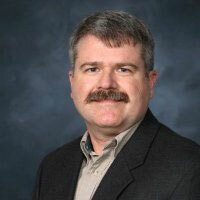 Sam Albrecht has over 25 years' experience in membership and programs for associations, with strong skills in community development, certification and accreditation, program and project management, strategic thinking and facilitation, organizational planning and growth, and new business development. His experience spreads across a number of industries, including agriculture, healthcare, aerospace, nonprofit, management services, technology, and small business management. His roles gave him extensive experience with professional societies, trade associations, membership organizations and certification organizations, which will serve PATH Intl. well as it moves further into being the certification leader in the equine-assisted activities and therapies industry. "I believe in the certification process," Sam says. "It's valuable to stand out from everyone else and shows a deep commitment to the industry. It's a measure of excellence that people look for." Sam has a Bachelor of Science degree in aerospace engineering from Auburn University, but he found that he did very little actual engineering. What he enjoyed was the people aspect of his job, and so he eventually found his way into nonprofit work. He also has a Master's degree in business administration and is a Certified Association Executive. His career path has taken him all over the United States, including Alabama, where he was raised on a small farm, California and New Jersey. But it was when he was serving at a duty station for the Air Force in Colorado Springs that he fell in love with Colorado, and while his jobs have taken him in and out of Colorado over the years, he and his family are now back in Colorado for good. Since he loves the outdoors, fishing and hunting, Colorado is a good place to land. Sam and his wife, Shari, have two children: Hunter (7) and Saige (4). They also have a dog, two cats and an elderly painted turtle. Join us in welcoming the following centers that joined PATH Intl. in August. Your vote is valuable to the future of your association. Please vote for the PATH Intl. Membership Oversight Committee Representatives for Regions 1, 3, 5, 7, 9 and 11. Click here to go to the ballots page. The ballots consist of nominees as recommended by the PATH Intl. membership in each respective region. Click on the ballot that corresponds to your region. Please cast only ONE vote for your region. Call the PATH Intl. office at (800) 369-7433, and we will mail or fax you a ballot. The ballots will be available until September 30, 2013, and contain short biographies of the candidates. Thank you for continuing to support your association. Please visit the PATH Intl. events calendar for a list of 2013 and 2014 Registered On-Site Workshops and Certifications.